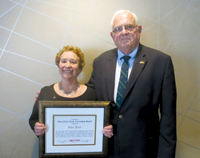 The Rhea Eckel Clark Citizenship Award was established in 1985 in memory of Rhea Eckel Clark, one of the founders of the Central New York Regional Planning and Development Board. Mrs. Clark distinguished herself throughout her career by working to improve the quality of life in Central New York while addressing issues of regional significance such as education, health care, community revitalization, environmental protection, and social justice. Mrs. Clark spent three terms as chairperson of the CNY RPDB from 1967-1969. During this period she helped to direct the agency through its formative stages and initiated work on a range of comprehensive planning issues confronting the Central New York community. In addition to her work with the CNY RPDB, Mrs. Clark was president of Cazenovia College from April 1957 to March 1971. She was also named director of the American Management Association for a three-year period beginning in 1968. Upon retiring from her presidency of Cazenovia College, Mrs. Clark headed Governor Rockefeller's State Commission of the Aging. Before coming to Cazenovia College, Mrs. Clark spent eight years with the New York University School of Education as assistant to the dean and consultant for community education and development. Previously, Mrs. Clark was executive secretary for New York State Citizens Council, Inc., and in 1949, she served in Germany as a visiting consultant to the U.S. Army of Occupation Program. During her lifetime, Mrs. Clark received a number of honors including the 14th Colgate Civics Awards presented to area men and women "who have exemplified, by their own generous service, the principle of democracy in action." Mrs. Rhea Eckel was married to Dr. Wesley C. Clark, who served as dean of the Syracuse University School of Journalism for more than 20 years. Support efforts that foster intergovernmental cooperation and civic participation. Rhea Jezer was named the recipient of the 31st annual Rhea Eckel Clark Citizenship Award at the Central New York Regional Planning and Development Board's annual meeting held on November 2, 2017. Ms. Jezer is an Adjunct Associate Professor at SUNY ESF and was previously a senior lecturer at Cazenovia College. Ms. Jezer holds a doctorate from Syracuse University, a master's degree from Columbia University, and a bachelor's degree from Brooklyn College. As a Congressional Fellow, she helped pen legislation for the encouragement of women and under-represented minorities to enter the fields of science and math. Ms. Jezer founded the Symposium on Energy in the 21st Century in 2005 and has been director and chair of the symposium for the past fourteen years. Ms. Jezer, an environmental consultant and policy advisor, was an environmental advisor for Senator Hillary Clinton, worked closely with Governor George Pataki, headed the CNY campaign for the 1996 Clean Water/Clean Air Bond Act, and was on Governor Pataki's Superfund Reauthorization working group. Ms. Jezer also served on the transition teams for President Bill Clinton, Attorney General Eliot Spitzer, and Governor Andrew Cuomo, and was a co-chair of the transition team for Attorney General Eric Schneiderman. Ms. Jezer was also a member of the New York State Committee for Hillary Clinton's Campaign for President in 2017. Ms. Jezer is a board member of the NY League of Conservation Voters, is the political chair of the Sierra Club Iroquois Group, and was chair of the Sierra Club Atlantic Chapter. She chaired the DeWitt Democratic Party and was a congressional candidate twice. She was also a presenter for the Al Gore's Climate Project. Among her previous awards are the Post Standard Achievement Award, the Greening USA Community Advocacy Award, the NAACP Humanitarian Award, the National Organization for Women's "Woman of Power" Award, and the InterFaith Works Leadership Award "for her work bringing environmental education to Central New York." 2013 Cornelius B. Murphy, Jr., PhD.